The best thing to do? RUN. I prayed before the run that my stupid right knee would keep its cool and not make a fuss through the run. I was planning on running an hour and also wanted to do a test run of running in my PureFlows with my custom insoles and ProCompression socks. I don’t usually wear thin socks with I run (last year, I wore compression socks AND thick socks). This time, I wanted to just try with the compression socks. Wow, you are probably super bored now. I obviously found a nice rhythm and was able to run faster than planned (for some reason, I always plan to run around 8:30. I think that’s a very conservative and comfortable pace for me). Negative splits, baby. I’m happy with that. Now, I know God is not a genie where I ask for this and He will grant it by command… I’m just so glad that by His grace, He is willing to listen to my request. 9 miles with no knee pain… so much better than Saturday’s run where I was just trying to keep my form! Today’s run was run on tired legs. Yesterday, I did 55 minutes of Insanity (I skipped the cool-down). Then it was followed up with one hour on the elliptical while watching Breaking Bad. I love to make the resistance go up to molasses speed (where it feels like you’re waist-deep in molasses. It’s like a strength training exercise, too!). Also, yesterday was just a lovely Sunday! I love hanging out with the youth adults! We went to Philz after lunch. I was fasting/abstaining from purchasing coffee from coffee shops for 40 days and yesterday, it was done! I ordered the Tantalizing Turkish (I think that’s what it’s called). Tammy was kind enough to get some crepes from the place next door. YUM! 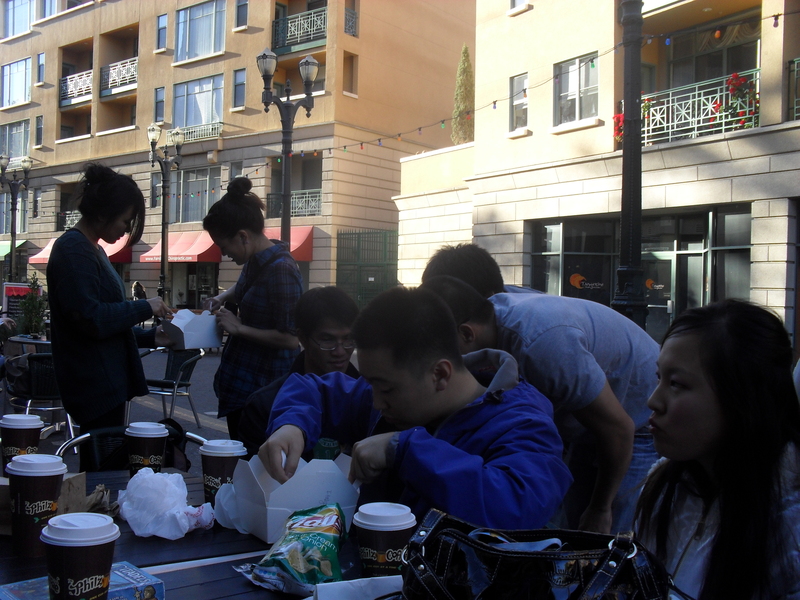 Whenever our group goes out, we always take over everything… there were like 12 of us grabbing chairs and tables. Sorry to everyone outside who didn’t get a table/seat. We were there for about two hours, drinking coffee, eating crepes (and some of the guys were playing Citadel). So fun, but MAN it got super cold! It’s super good. Don’t worry, I ate it later as dessert. Dinner was at a beef noodle place. I decided to go with the broken rice plate with BBQ chicken and added a fried egg (for one dollar. Totally worth it). I think this will be my new go-to meal when I get Vietnamese food (unless of course it’s one of my favorite chicken pho places). Afterwards, Joe and I watched some documentaries (one was about Magic Johnson and another was about Lakers season 1999-2000). I love watching these kinds of documentaries. And Esther’s friend, Jenny, made some chocolate-covered pretzels (for Peppero day yesterday: 11/11). I gave the chocolate one to Joe because I knew he’s not a big fan of white chocolate. Neither am I, but I kind of liked the hearts on that one, hehe. I got home and let Vanna in the room with me. 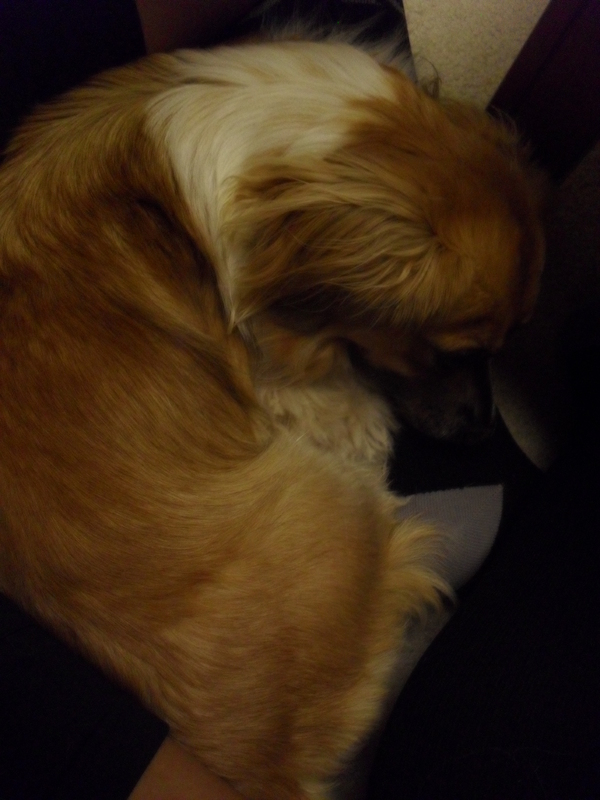 I like to sit on the floor, and so she decided to cuddle with me. Goodness, her fur is getting all wild again. I’ll have to cut it soon. Hehehe, she’s so darned cute. 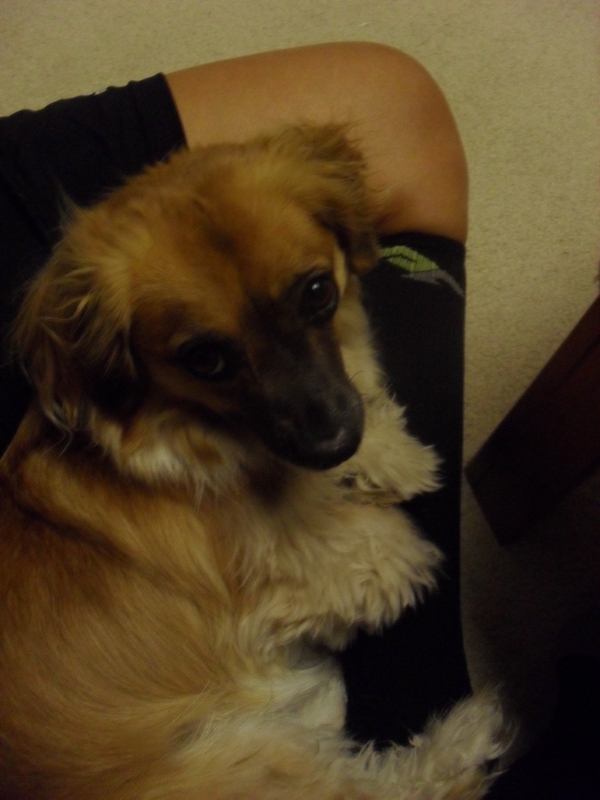 When she looks up at me like that, I just melt and talk in my creepy high-pitched voice. “Awww, you’re shoh cuuuuute, shohh cute, my Vannaaa.” If you were there, you would get super annoyed. One week to go before Turkey Sunday and the Thanksgiving Holiday! I keep scrolling back up to peek at that kettle corn. It looks heavenly. Thanks! And yeah, the kettle corn is a pretty good (light) dessert to have after a salty meal.